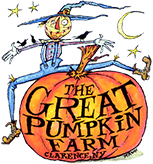 Area high school technology teams have been working for weeks to design and build trebuchets (pronounced treb-yeh-SHETs) to compete in this weekend’s annual Pumpkin Catapult Contest, as part of The Great Pumpkin Farm’s Fall Festival. Fifteen teams from 13 area schools are scheduled to compete for distance and accuracy and with enough precision to win cash prizes for their schools and prestige for their teams. Students from Depew High School took two of the top three honors last year: Longest Single Throw (483 feet) and Combined Throws (total of 1,396 feet). Nichols School took the Storming the Castle trophy.